The “O” word drives health costs in America ever-upward. Without bending the obesity curve downward toward healthy BMIs, America won’t be able to bend that stubborn cost curve, either. The Economic Impacts of Obesity report from Alere Wellbeing accounts for the costs of chronic diseases and how high obesity rates play out in the forms of absenteeism, presenteeism, and direct health care costs to employers, workers and society-at-large. Among the 10 costliest physical health conditions, the top 3 are angina, hypertension and diabetes — all related to obesity and amenable to lifestyle behavior change. The top-line numbers set the context: $73.1 billion or more in direct health costs and productivity losses. Obese men use nearly 6 more sick days every year; obese women, over 9 days more (think: nearly 2 weeks of work lost per year by each obese woman). On the public health score, the CDC calculates that 80% of heart disease and stroke, 80% of Type 2 diabetes, and 40% of cancers could be prevented through changing lifestyles by people eating more healthfully, getting more physically active, and quitting smoking. Health Populi’s Hot Points: Two research papers are on my mind to further inform and understand the Alere paper on obesity economics. 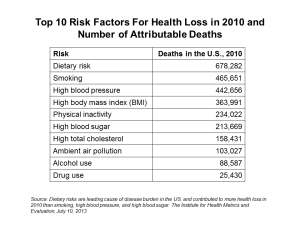 First, in August 2013, JAMA published The State of US Health, 1990-2010: Burden of Diseases, Injuries, and Risk Factors. In this paper, the US Burden of Disease Collaborators find that while life expectancy at birth and healthy life expectancy (HALE) increased between 1990 and 2010, morbidity and disability account for almost one-half of the health burden in the U.S. “Improvements in population health in the United States have not kept pace with advances in population health in other wealthy nations,” citing the researchers’ analysis of the 34 OECD countries (the world’s most-developed economies). Second, new research published in BMJ (the British Medical Journal) finds that exercise can be as effective as drug intervention for mortality outcomes in certain conditions. In Comparative Effectiveness of Exercise and Drug Interventions on Mortality Outcomes: Metaepidemiological Study,” Naci and Ioannidis examined peer-reviewed research studies looking at exercise vs. drugs and their impact on mortality across four conditions: coronary heart disease, post-stroke rehab, heart failure, and diabetes. There were no statistical differences between exercise and drug interventions for heart disease and diabetes, and physical activity was more effective than drug treatment for stroke. Heart failure was the condition where diuretics as a drug intervention were more effective than exercise. Two factors that are within reach of regular people can dramatically impact health, quality of life, and health care costs: food and activity/exercise. Getting beyond a “corporate culture” of health toward a national (dare I dream “global?”) culture of health is the prescription. We’ve begun to try and inspire this on HealthcareDIY. Come see what eating right, living well, shopping smart and using technology can do to help you and your social connections (friends, family, colleagues) act on the food/activity/health connection.